Carter International Custom Carpets, Inc.
For your convenience, our collections are available in architect folders for your showroom or design house. For more than 85 years Carter has satisfied discriminating tastes around the world with elegant custom-made carpets and area rugs made from 100% New Zealand wool. 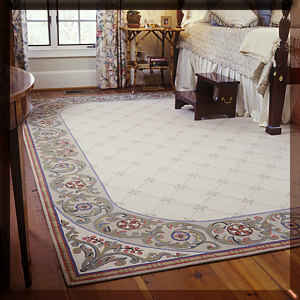 Our carpets and area rugs grace the most prestigious homes and businesses throughout the world. Carter proudly maintains an international reputation for superior quality and service to our clients. With Carter your design options are limitless. We offer 342 standard colors and more than 200 different textures in 100% New Zealand wool, Merino wool, European silk and 100% Upland Cotton. You select shape, color, size, texture and design to receive original floor covering that will accentuate your décor and provide luxury and satisfaction for years to come. Our artists are available to assist your design team in fashioning the perfect piece for your special needs. We will create your unique design according to your exact specifications, or you can peruse our extensive portfolio of collections that include our handmade area rugs, pass machine and broadloom carpets. Our goal is to provide you with a one-of-a-kind work of art for your floor. Our craftsmen take pride in bringing to life the finest carpets and area rugs. Let us make your rug and carpet ideas a reality.